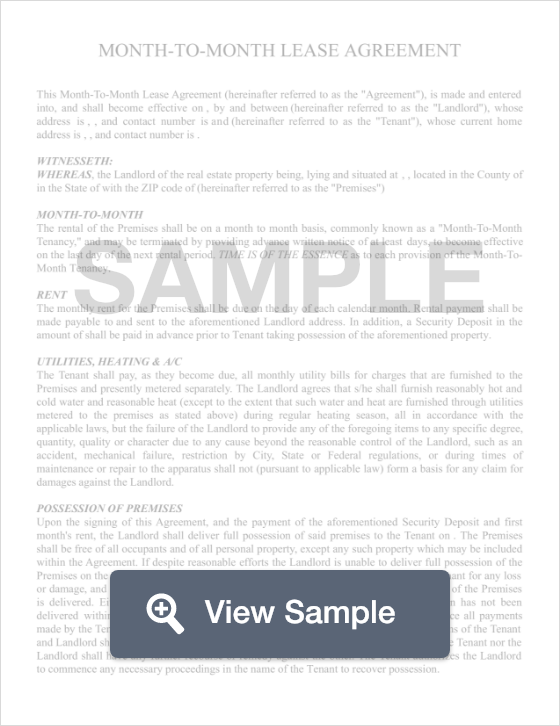 What is a Hawaii Month to Month Lease Agreement? Hawaii Month to Month Lease Agreement: What Is It? In Hawaii, a month to month lease agreement is a legal contract that allows a landlord to rent a property or apartment to a tenant for a short period of time (one month). This type of agreement is beneficial for both landlords and tenants in the sense that it offers great flexibility without a long term commitment. In addition, the lease automatically renews at the beginning of each month, so both parties can remain in the lease agreement until either party decides to terminate the agreement. These types of contracts work just like long term lease agreements, providing specific information on rent payments, their due dates, property rules, and tenant provisions. Minimum Termination Period – Landlords - 45-day notice; Tenants - 28-day notice. According to Hawaii’s tenant laws, a tenant may terminate a month to month lease agreement as long as he or she provides at least a 28-day notice (in writing). If a landlord were to terminate a month to month lease, he or she must provide the tenant with a written notification at least 45 days before the termination will be deemed effective.